All doors installed by Elite Garage Doors (Midlands) Ltd come with a 2 year fitting warranty from date of installation. The purchaser is granted a warranty covering the safe and reliable operation of the Cardale/Novoferm garage door for a period of 10 years from the date of purchase. This warranty is conditional on the regular inspection and maintenance of the product in accordance with the installation manual supplied with the door. During the guarantee period the manufacturer undertakes to repair, without charge, any product which has suffered a proven failure of its safe and reliable operation provided that the springs, tracks and guide rollers have been inspected regularly (at least once a year) and maintained correctly, including replacement of wear items when required. 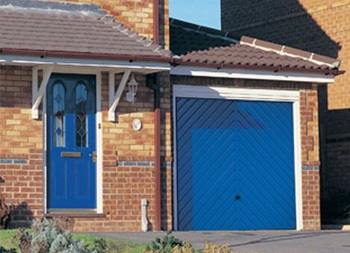 All Cardale/Novoferm garage doors offer a 10 year warranty against the integrity of the door panel, as well as 2 years on rollers and springs for normal use, up to 25 open and close cycles a day. All retractable garage doors offer a 10 year manufacturer’s guarantee (2 years for canopy doors) on material and manufacturing faults of all immovable frame parts, if it can be proved that they are inoperative, or their use is impaired. In the case of Novoferm steel doors, these are supplied factory prefinished in polyester based white. They are not immune to damage which can occur at any stage of the handling of the product from factory to site. Minor surface damage can be easily repaired using touch-up sprays or sticks without invalidating warranties. The corrosion of swarf filings or other air borne particles, rusting or staining of the panel is not considered as panel rust. 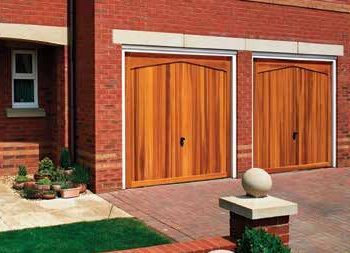 Cardale/Novoferm timber doors use organically grown Cedar from replenishable sources, with natural colour and grain variations – this is a feature of Cedar. We make every effort to harmonise the effect, where possible, by hand matching the component parts used in construction. Please note that a uniform grain pattern cannot be guaranteed. Timber doors must be finished in accordance with the installation instructions, supplied with the door and the technical specification. 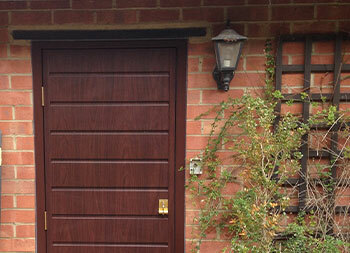 Cardale/Novoferm timber doors are supplied with a temporary finish. As soon as the door is unwrapped one coat of a good quality basecoat primer must be applied to both sides of the door. Immediately after installation your timber doors require two further coats of a good quality exterior wood finish on both sides. Initial application and periodic treatment should be carried out strictly in accordance with the wood stain manufacturer’s instructions. Failure to follow these instructions will result in early deterioration of the timber panel. Please note that protective finishes on all Timber doors must be applied to validate warranty. The purchaser is granted a warranty covering the safe and reliable operation of the Cardale/Novoferm garage door for a period of 10 years from the date of purchase. This warranty is conditional on the regular inspection and maintenance of the product, in accordance with the installation manual supplied with the door. During the guarantee period the manufacturer undertakes to repair, without charge, any product which has suffered a proven failure of its safe and reliable operation provided that the springs, wire cables, tracks. guide rollers and hinges have been inspected regularly (at least once a year) and maintained correctly, including replacement of wear items when required. 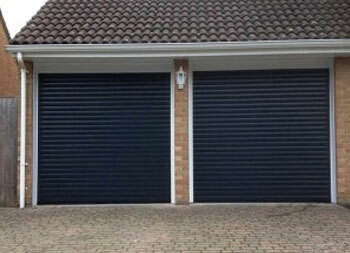 All Cardale/Novoferm garage doors offer a 10 year warranty against the integrity of the door panels, as well as 2 years on rollers, springs, pulleys and cables for normal use, up to 25 open and close cycles a day. All Novoferm garage doors offer a 10 year manufacturer’s guarantee on floor seals, central seals, side seals and header seals against perishing. All Cardale/Novoferm garage doors offer a 10 year manufacturer’s guarantee on material and manufacturing faults of all immovable frame parts, if it can be proved that they are inoperative, or their use is impaired. Furthermore, Cardale/Novoferm fully finished steel doors (i.e. factory finish painted, Golden Oak, Rosewood) come with a 10 year panel corrosion guarantee relating to rust through inside or outside. If a panel rusts through, then the affected panel only will be replaced. Due to weathering, the new panel may not exactly match the colour of the old. 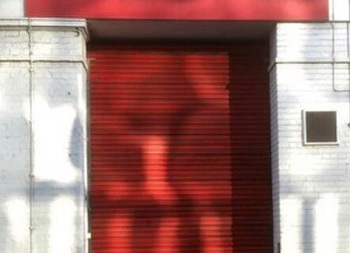 In this instance the door should be repainted by the customer with a proprietary paint system, following the paint manufacturers’ instructions. All steel parts are not covered by the corrosion warranty if situated within 3 miles of the coastline. In areas of high corrosion, (e.g. if exposed to sea air), the door panels should be painted with a proprietary paint system, following the paint manufacturers’ instructions and that the door should be regularly cleaned. The corrosion of swarf filings or other air borne particles, rusting or staining of the panel is not considered as panel rust. The surface finish of Rosewood and Golden Oak foil finished sectional door panels is guaranteed from serious degradation for a period of 5 years, provided that regular maintenance including cleaning from salt is carried out in accordance with our instructions. During this period the colour of the door panels may change due to weathering (e.g. Intense UV radiation and coastal conditions etc). This is normal and is not covered by the warranty. 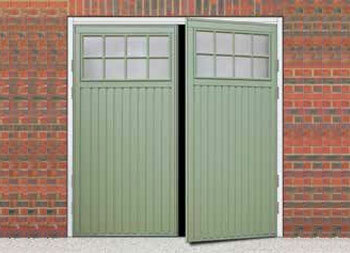 In the case of Cardale/Novoferm pre-finished steel doors, these are supplied with polyester based primer paint finish. They are not immune to damage which can occur at any stage of the handling of the product, from factory to site. Minor surface damage can be easily repaired using touch-up sprays or sticks without invalidating warranties. Cardale/Novoferm timber sectional doors are supplied unfinished, please ensure that a full specification of finishing coats are applied immediately before or after installation to all exposed surfaces – inside and out, with a Sikkens or similar finishing coat system. Please note that protective finishes on all Timber doors must be applied to validate warranty. 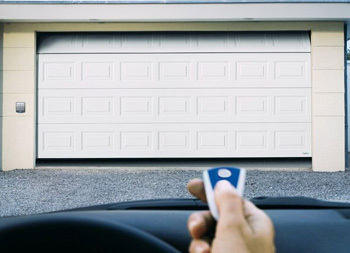 The purchaser is granted a warranty covering the safe and reliable operation of the garage door for a period of 10 years from the date of purchase. This warranty is conditional on the regular inspection and maintenance of the product, in accordance with the installation manual supplied with the door. During the guarantee period the manufacturer undertakes to repair, without charge, any product which has suffered a proven failure of its safe and reliable operation, provided that the door has been inspected regularly (at least once a year) and maintained correctly, including replacement of wear items when required. 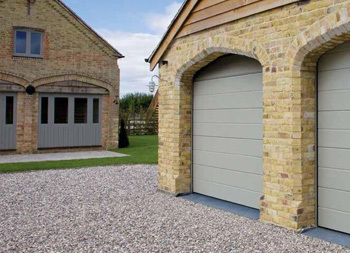 Cardale/Novoferm Insulated Roller Garage Doors are guaranteed against any form of manufacturing defects for a period of 2 years from the date of purchase. The finish of white powder coated doors is guaranteed for a period of 2 years. In the case of textured woodgrain finished doors, the exterior finish is guaranteed to provide an effective weatherproof membrane which will resist perforation of the door from the weather-side due to corrosion for 10 years. Furthermore, colour change or fade to the exterior surface will be limited and uniform for the full 10 year period. Some marking may occur at the top of the internal side of the door curtain, this is unavoidable and is due to prolonged contact with autolock system. For garage door operators: Cardale DC650 and DC800 and Novoport and Novomatic we grant the following warranty, in case of supplying us with the original invoice: 5 years for mechanical parts of the operator motor and the control unit; 2 years for remote control parts and accessory parts. A 2 year warranty is also granted for remote control parts and accessory parts. No warranty claims will be accepted for wear and tear parts and consumption parts (e.g. light bulbs, batteries, fuses). Cardale/Novoferm Insulated Roller Garage Door electric operators are guaranteed against any form of manufacturing defect for a period of 5 years for mechanical elements, motors and transformers. The motor control unit is guaranteed for 3 years. Remote control accessories and parts are guaranteed for a period of 2 years. No warranty claims will be accepted for wear and tear parts and consumable parts (e.g. light bulbs and batteries and remote control handsets). If in doubt about any maintenance procedures, please consult your Cardale/Novoferm specialist. Immediately after the door is fitted and after every 5,000 operations of the door, or at least once a year, oil all pivot points and check tightness of screws and clamped connections. Keep running tracks clean (do not grease them), check all parts and replace any worn components. The springs should be replaced by an experienced door fitter after approximately 25,000 operations (see fitting and operating instructions). You should not oil the lock cylinder. If it is sticking, lubricate it with graphite dust. If you have a canopy door, check the cable every 6 months of normal usage (8 operations per day). If you find any wear, you should have the cables replaced by an expert installer. We will then supply details of your claim, together with a copy of the warranty card supplied with the door and proof of purchase, to the warranty department at Cardale/Novoferm. An assessment of the claim will be made. This may mean Cardale/Novoferm will need to come and inspect your door at your premises. In the event that there is no legitimate claim under the terms of the warranty you may be liable for the costs of this visit. It is essential that you take note of the careand usage instructions provided with your door and you follow these instructions throughout the lifetime of your door. All dark colours which are exposed to direct sunlight should be avoided. Dark coloured doors may undergo expansion due to heat absorption. Such instances are not covered by the guarantee, however normal performance will revert when the door has cooled down if the heat absorption has affected the door’s performance.